Archimedes originated the method of finding density by using water displacement. One story of his discovery involves the king's gold crown, a possibly larcenous jeweler and a bathtub. True or not, the story survives in one version or another because of the importance of Archimedes' discovery rather than whether the jeweler really tried to cheat the king. Calculating density uses the formula D = m ÷ v, where D means density, m means mass and v means volume. Find mass using a balance scale, and use water displacement to find the volume of irregular objects. Water displacement works because the amount of water displaced by an object submerged in water equals the volume of the object. If an object submerged in a graduated cylinder raises the water level from 40 milliliters to 90 milliliters, the volume change of 50 milliliters equals the volume of the object in cubic centimeters. All matter has mass and takes up space. Density, a calculated value, measures the amount of matter in a space. To calculate the density of a material, find the mass and the volume of the object. Calculate the density of the object using the formula density equals mass divided by volume, D = m ÷ v.
Finding mass requires using a balance scale. Most mass scales balance the unknown object against a known mass. Examples include triple beam balances and true balances, like the classic scale seen in an assay office. 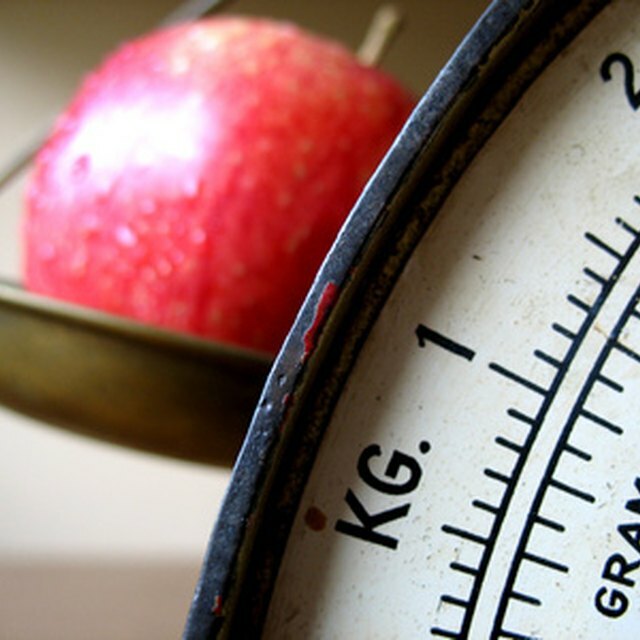 Electronic scales may also be set up as mass scales. Bathroom scales, aside from lacking the degree of accuracy required, measure weight, not mass. Mass measures the amount of matter in an object while weight measures the pull of gravity on the mass of an object. Finding the volume of regular geometric objects uses standard formulas. The volume of a box equals length times width times height, for example. Not every object, however, fits a formula. For these irregularly shaped objects, use the water displacement method to find the volume of the object. Water displacement uses a particular property of water: 1 milliliter (abbreviated ml) of water takes up 1 cubic centimeter (cm3) of space, or volume, when the water is at standard temperature (0°C) and pressure (1 atmosphere). An object completely submerged in water displaces or offsets a volume of water equal to the volume of the object. So, if an object displaces 62 ml of water, the object's volume equals 62 cm3. Methods for using water displacement to find volume require submerging the object in a known volume of water and measuring the change in water level. If the object fits into a graduated cylinder or a measuring cup, you can read the measurement directly. If the water level starts at 40 ml and changes to 90 ml after submerging the object, the volume of the object equals final water volume (90 ml) minus initial water volume (40 ml), or 50 ml. If the object doesn't fit into a graduated cylinder or measuring cup, you can measure the volume of displaced water in different ways. One method requires placing a bowl in a tray or larger bowl. The inner bowl must be large enough to completely submerge the object. Fill the inner bowl completely full of water. Carefully, without creating waves or splashing, slide the object into the bowl, letting the displaced water spill into the larger bowl or tray. Remove the inner bowl very carefully so that no extra water spills. Then measure the volume of water in the larger bowl. That volume equals the volume of the object. A second, perhaps more practical method, also uses a bowl. The bowl must be large enough to completely submerge the object without overflowing. Start by filling the bowl with sufficient water to completely cover the object. Before adding the object, mark the water line in the bowl. Like the graduated cylinder, this marks the initial volume of water. Next, add the object, being sure the object is completely covered by water. Mark this water line on the bowl. Now, carefully remove the object from the water. At this point, the change in water volume needs to be determined. One method measures the amount of water required to raise the water level from the initial volume line to the final volume line. This volume equals the volume of the object. A second method measures the amount of water used to fill the bowl to the first line, then measures the amount of water required to fill the bowl to the second line. Using the formula final volume minus initial volume (vf – vi) yields the volume of the object. If the initial volume of water equals 900 ml of water and the final volume of water equals 1,250 ml, the volume of the object is 1250 – 900 = 350 ml, meaning the volume of the object equals 350 cm3. Once you've measured the mass and volume of an object, finding the density requires putting the measurements into the density formula D = m ÷ v. For example, if the measured mass equals 875 g and the measured volume equals 350 cm3, then the density formula becomes D = 875 ÷ 350 = 2.50 grams per cubic centimeters, usually written as 2.50 g/cm3. How Do You Find the Volume of an Object? G, Karen. "How to Calculate Density by Water Displacement." Sciencing, https://sciencing.com/calculate-density-water-displacement-7373751.html. 16 May 2018.